Slowing down the discourse on the meanings of today’s fast-paced technological and scientific change. Are we alone in the cosmos, and if so, how should we think of ourselves? What do the insights of evolutionary theory mean for ethics? Is the so-called replication crisis a sign that modern science is self-correcting or that it has dangerously lost its way? How does the evolving theory of information in physics change the way we understand ourselves and the world? In a world dominated by Twitter conversations, addressing big questions in ways that require more than 280 characters is difficult. Tackling them requires careful, deliberate reflection, multiple vantage points, and an approach that aims to be both of-the-moment and timeless. Beginning in 2015, the John Templeton Foundation provided funding for a series of special sections in The New Atlantis, allowing the magazine’s editors and writers to devote additional resources to address many such big questions. In several sets of paired essays and one full seven-article issue, The New Atlantis probed questions with no easy answers but many important implications. 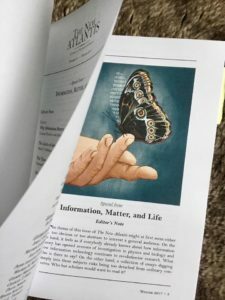 A similar set of essays on evolution and ethics anchored a special section entitled “Descent of Man” that appeared in the spring of 2017. Biologist Kevin Laland examined the latest findings on the evolutionary origins of human cooperation, while philosopher of science Michael Ruse provided a 5,600-word essay on how our culture’s growing internalization of evolutionary theory may have the side effect of undermining our ethical foundations. The New Atlantis “Big Questions” series that has caused the greatest stir — and is still creating ripples through academic citations and late-arriving Twitter reviews — was the “Integrity of Science” section published in the summer of 2016. Released in the context of several recent high-profile retractions in elite scientific publications, as well as a growing “replicability crisis” in which researchers were unable to reproduce the results of many highly-cited studies, the section examined how modern, Western science arrived at its present situation and possible ways forward. Science journalists Ivan Oransky and Adam Marcus offered “Two Cheers for the Retraction Boom,” suggesting that increasing retractions were a sign of self-correction within science. Former law and psychology professor and journal editor Barbara Spellman gave an analysis of the demographic trends in science and science publishing that led to the crisis. She suggested possible solutions, recommending moves towards open science frameworks and alternative venues for published research, including online-only journals. The biggest stir, though, was created by Arizona State University professor Dan Sarewitz’s bracing call for “Saving Science.” In Sarewitz’s view, the most productive way to practice science is actually to avoid the ideal of curiosity-driven investigation unfettered by an aim to solve specific technical problems. “Scientific knowledge advances most rapidly, and is of most value to society, not when its course is determined by the ‘free play of free intellects’ but when it is steered to solve problems — especially those related to technological innovation,” Sarewitz writes. The problem-solving approach to science, in large part driven by U.S. military research funding, resulted in numerous discoveries which made possible many of the advances — from microprocessors to the Internet — that underpin technologies used widely today. In Sarewitz’s view, basic research without an end-goal in mind can become indifferent or even irresponsible. “Advancing according to its own logic, much of science has lost sight of the better world it is supposed to help create,” he writes. Read the latest essays and news from The New Atlantis.